Our service staff Bryan, Jack, Dan, Dalton and Cory install heating systems, gas hot water heaters, L.P. room heaters, handling all service oil, and L.P. Gas; Rinnai, Empire LP Space Heaters, Buderus, Smith, Triangle Tube, Weil Mclain Biasi Boilers, Gibson, Miller and Thermopride hot air furnaces. We also install Cold Climate Heat Pumps, Air Conditioning, and LP service to LP Generators, cookstoves, and dryers. Our service staff has completed the State of Vermont’s CETP Training (Certified Employee Training Program), allowing us the most recent knowledge of the L.P. Gas Business, Silver Certificate for oil, and continues to takes classes in all of these fields to stay current with the new technologies out there. We also have a Master License Plumber, and Air Conditioning Service Techs. Jackman’s of Bristol, Inc. Technical Staff have been also Natural Gas Certified. 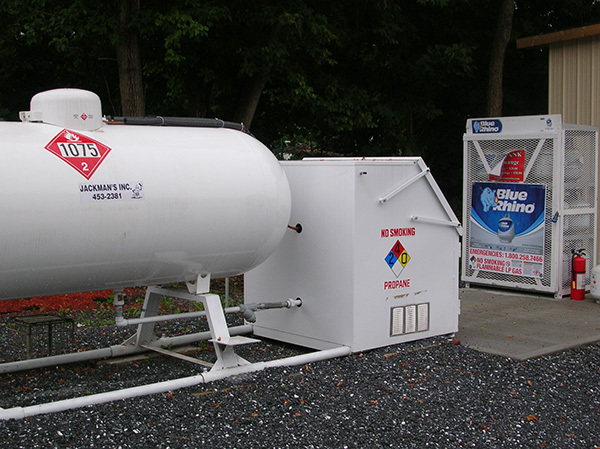 Ensure your above ground tank is safe to fill! Jackman’s also performs Aboveground Storage Tank (AST) Inspections. These inspections are required every three years by VT law for aboveground heating oil and kerosene storage tanks. Call us at 802.453.2381 to schedule your inspection. We can also perform any necessary repairs or replacements.